Cheating at roulette was wide spread in Las Vegas till gambling became legalized in 1931. Nowadays to cheat roulette is very risky and unreasonable. 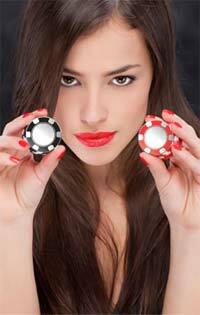 Some gamblers are looking not only for excitement of the game but also for "easy" winning. Some managers of casino or dealers want to enlarge the house edge of the casino. All of them use forbidden methods of roulette cheating. The most well-known among them are: past posting, ball tripping, laser scam, top hatting and use of magnets. Those cheaters who prefer to settle electromagnets on the roulette wheel definitely use one of the hardest way of cheating. First of all there should be a steel core in the roulette ball. Another difficulty is to connect magnets and buttons with magnetic force. A skilled croupier is able to direct the ball. In order to increase the house edge up to 5.26% magnets may be placed into the pockets. But depending on bets the dealer varies the ball with steel core and regular one. Drill in upper ball track a very small hole. Place below the surface a tiny controlled pin. A small lever should be installed under the table. Then the croupier should imperceptibly "catch the moment" to turn on the pin by pushing the lever. Though laser was created only about 50 years ago it became a way of cheating soon. Laser may be hidden in into the cell phone. The device calculates the probable position of the ball after the spinning basing upon the speed of the ball and time during which the ball will be spinning.